Today’s blog entry is a little different from the usual theme of showing photos of Seagate’s farm and factory, in to bring you Grover’s “Disease” or “Rash”, or whatever it is?? The word disease is in parenthesis because dermatologists have no idea what it is, what causes it, how to treat it or if it is really a disease or just a very difficult skin rash. This Grover’s topic is a continuation of the seaweed blog entry from last week which you will find by scrolling down this page. Seaweed powder is the only reason I have been able to sleep through the night for the first time since November. The “Diving at 60” person has had this horrible rash the dermatologists call – Grovers – which began late last year. It started as a small area of red itchy skin in a ring below the neck and gradually spread across the upper chest and middle of the back. The red spots became more and more red and itchy and spread ever lower. As is typical of most men, I ignored the problem for a while, actually for almost 4 months. Home remedy help — Diving and traveling in the tropics have taught me how to get temporary relief from severe itching caused by mosquito bites, sand fleas, no-see-ums and other forms of itchy misery that Nature seems to have placed in paradise. The only thing that I have found to help relieve this type of itching is hot (very hot) showers. Get the water temperature as high as your skin can tolerate without scalding yourself. Stay under the spray for 5 to 10 minutes and in most cases the itching will subside and hopefully completely disappear for a few hours, giving you some much-needed temporary relief. There have been trips where I have been covered with over 400 sand flea bites, and allergically reacting to each one of them. You can gain 1 hour of peace and sometimes up to 6 hours if you are lucky using a hot shower, before the waves of itching course through your body. In the beginning, I considered these various possibilities: food allergies, excess residual soap staying in my clothes from the laundry; allergic reaction to the soap; microscopic skin mites inhabiting the mattress; bed bugs; and even a systemic fungal infection. I experimented with a very low-carb anti-fungal diet along with the olive leaf. It did not help. By February, this itchy rash became intolerable. I went to a dermatologist who did a biopsy, sent samples of skin to a lab and determined that the rash was a condition called Grover’s. It is not fungal, not bacterial, and actually the doctors have no idea what causes it or how to treat it. It generally occurs in people over 50 years of age. 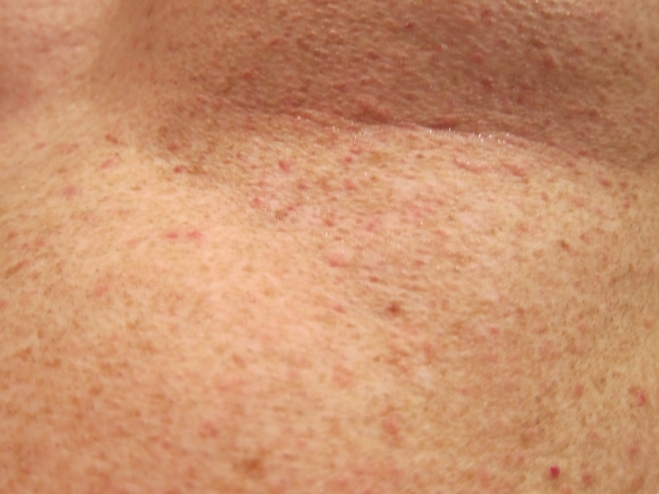 The red itchy bumps appear on the upper body, front and back, generally towards the center. My doctor prescribed an anti-itch cream and advised that there was nothing that they could do to get rid of it. The cream prescribed was a topical steroid. Not a good idea for long-term use. It also didn’t work. The rash continued to get worse. 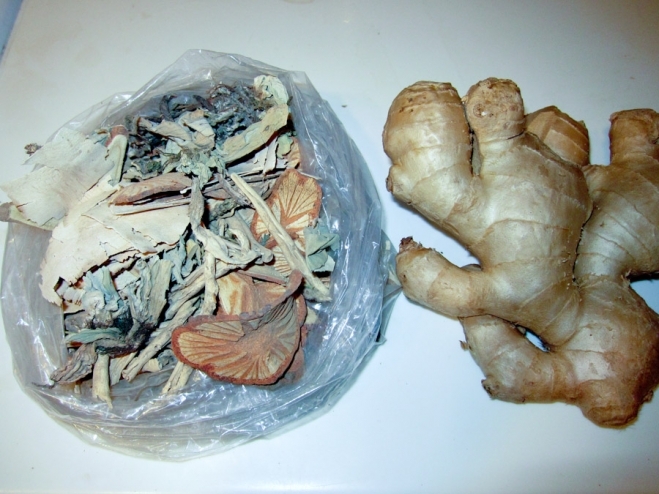 By March I contacted a Chinese herbal doctor who concocted a mixture of roots and bark which I brewed into a tea, 3X per day. It seemed to stop the spread of the rash but it never went away. However, I did get very proficient in how to brew Chinese tea in a crockpot. The mixture of bark, roots and miscellaneous vegetable matter this Chinese doctor provided when boiled in the ceramic crock pot gave off a potent smell. The use of a long extension cord to place the crockpot outside and as far away as possible from people is very important if you want your marriage to continue during the brewing cycle. After two months brewing and drinking the Chinese tea each day, the rash did not seem to get worse. But it was not getting any better. At this point I had logged over 180 days in a row of interrupted sleep, along with extreme daytime itching. By May, I decided to try one more visit to another dermatologist. I informed the doctor that I was brewing and drinking a Chinese tea. This dermatologist who happened to be very experienced and an excellent doctor with over 50 years in practice told me that the tea would probably be better used if I were to pour it (after some cooling down) directly onto the skin. This doctor also knew that we produce seaweed powder. So he also suggested that I sprinkle the seaweed powder directly onto the rash. I tried the direct application of the seaweed and the very first night, had an uninterrupted night of sleep. The method I use is to first take a warm shower to open the pores and then apply a little power onto the rash adding a few drops of water to make it into a paste. I then rub the paste gently over the itching skin. The powder will cause the skin to sting, which actually feels good compared to the alternative which is itching. After 10-15 minutes of the seaweed application drying on the skin, I rinse off the paste in a warm (not hot) shower. The initial effect of the water spraying the skin will cause more stinging. The stinging actually feels good. Then gently I towel dry the skin. You do not realize how good a night of sleep can feel until you have had 180 consecutive days waking up in the middle of the night with this itchy nightmare. The strange thing was to find a solution to the problem in our own warehouse after exhausting all that modern dermatology and ancient Chinese medicine had to offer. The photo of the week is an underwater shot pointing up towards the surface with 2 strange unidentified fish floating past the silhouette of the sky. The dark and light areas of the water surface is caused by waves reflecting and refracting the light. My husband started what looks exactly like this rash in 2002 after a visit to Arizona where we now live. It spread throughout his body. Would shed, peel, blister, itch!! !, etc. Yes nothing worked until he started taking your Olive Leaf Extract about 3 capsules three times daily. I started to notice that it was also anxiety related. In 2008 during a breakout in the hospital the doctor prescribed liquid Nystatin. He now takes this along with smaller doses of Olive Leaf. For the most part he is rash & itch free with occasional breakouts usually in the summer. I might consider the seaweed treatment if it ever gets bad again. This is a horrible rash & as you discovered the dermatologists & doctors don’t know anything. I learned about Nystatin on Know The Cause but was unable to get a doctor to prescribe until they had tried everything else in the hospital. Thank you for your products. I personally use the Stop Rash all year under my arms for summer breakouts & recently started the Nasal spray for allergies (I haven’t had to use oral meds since). Shane - Thank you for the information. I am struggling with Grovers disease now, and I am ordering your seaweed powder today. How many applications did it take to see your results? Katie Fobert - I have no experience with Grover’s , but I live in a household of red-heads who are very sun sensitive, I do not like sunscreen because of the chemicals so I have resorted to supplements to help from the inside out. I start in april when the sun starts to strengthen in the north . We use paba and astaxanthin supplements to minimize the damage, Astaxanthin is a potent antioxidant and you do not have to worry about overdosing on it. Make sure you use only natural supplements as synthetics will not have the same effect. to find out more go to Dr. mercola website, perhaps it could help with this problem, just a thought. Kyle - Thanks for your comments Richard. I live in South Africa , where can I get this seaweed from? The easiest way to do it is to order off our website. Graham Cairns - I have been suffering from Grovers Diseases for x3 years and have tried every conceivable concoction , all to no avail. How effective would seaweed powder be if it was added to a bath as opposed to a shower? My problem is that the spots are everywhere as opposed to one specific area. I need to get some relief from somewhere. If you add it to a bath, you would just be diluting it and wasting it. It won’t work that way. I can only tell you what worked for me — a very hot shower followed by placing the seaweed powder directly on the areas and rubbing it in as it turns into a paste. Then letting it set for a few minutes and washing it off with very hot water. If you don’t want to deal with ” the everywhere problem ” all at once, then try it in on specific easy-to-reach areas like your arms or chest and see if it gives you some relief. Just the hot water alone will do a lot for you. It helped me sleep. But it did not make the spots and itching go away. Once I started on the seaweed and the hot water, little by little the spots and itching faded. At the very beginning, I was doing this 5-6 times a day, or whenever the itching came back and I was home and the shower was available. Also, swimming in a chlorinated pool seemed to give some temporary relief. Its been almost 2 years since it has all gone away. We don’t claim that seaweed is any sort of cure. I am just writing in the blog what worked for me …. and I had tried everything imaginable. Alexandre navarro - Hello, i’m from Brazil and i discovered that i have “grover,s disease”. Now i’m looking for anything that could help me. This is in answer to the question about purchasing the Seaweed. You would order it on our website. We don’t have distributors outside the U.S. If you have trouble ordering, let us know. Depending upon how severe the Grover’s itching is, you may have to apply it many times throughout the day and night (every 4-6 hours) following a hot shower or bath. Use the hottest water you can tolerate on the rash without burning your skin. Then apply some of the powder while in the bath, making a paste and rubbing it on. Allow it sit on the skin for ~ 10 minutes. Then wash off with hot water (no soap). This has helped many people with the itching. The red rash may or may not disappear, or may partially fade out with time. However, controlling the itching is the main thing.